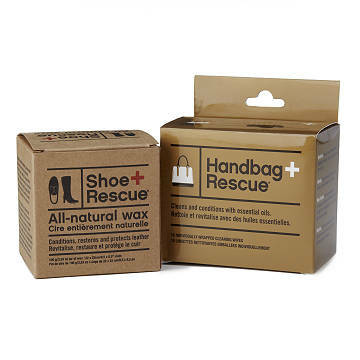 This all-natural kit helps extend the life of shoes and handbags by keeping them clean and conditioned. We know we're not supposed to love things, but when it comes to shoes and handbags, we can't help it. The secret to long, happy relationships is simple: protect them. Use the individually wrapped wipes in this kit to safely remove dirt, mud, and other unwanted splotches on the go. Their essential oils keep bags and shoes soft and smooth. After cleaning, condition with the super spreadable wax, made with ingredients like beeswax and coconut oil. Stash some in your desk, glove compartment, and suitcase. Includes cleaning cloth. Designed in Canada. Made in China.